Erin Miller | Galion Inquirer Galion golfer Matthew McMullen finished with the best score on the team at the Division II Golf State Tournament over the weekend, shooting a 36-hole score of 163. The Tigers finished fifth as a team in their second consecutive appearance in the state tourney. COLUMBUS — Over the weekend, the Galion Tigers’ boys golf team was in competition at the 49th Annual Division II Golf State Tournament. The trip down to Columbus and the Ohio State University Scarlet Golf Course, a Par 72 course, marked the second consecutive trip to the tourney for the blue and orange. After a sixth place finish last season at the NorthStar Golf Club in Sunbury, the more experienced Galion squad was looking to move up in the DII ranks in 2018. After the first day of action on Friday, October 12, the Tigers found themselves in fourth place, firing a 333 as a team, trailing the leaders from Gahanna Columbus Academy by 20 strokes. In the final day of competition on Saturday, Galion would see themselves shoot a 346 to put their two-day tally at 679 which would award them a fifth place overall finish in the 12-team field. In total, there were 24 teams represented and 72 golfers in the field. Columbus Academy would defend their state championship from 2017, turning in a 313 and a 312 for a total of 625 and a nine-stroke win over runner-up, Chardon Notre Dame-Cathedral Latin (324, 310; 634). Notre-Dame Cathedral-Latin was also the runner-up to Columbus Academy in 2017 at NorthStar. Last season’s third place team from Kettering Archbishop Alter would once again play to a third-place finish, notching team scores of 325, 335 for a total of 660. Rounding out the field in Division II play were: 4. Dayton Oakwood- 341, 333= 674; 5. GALION- 333, 346= 679; 6. Coshocton- 336, 344= 680; 7. Gates Mills Hawken- 347, 341= 688; 8. Cincinnati Wyoming- 351, 346= 697; 9. Cuyahoga Valley Christian Academy- 355, 361= 716; 10. Archbold- 360, 364= 724; 11. Chillicothe Unioto- 395, 376= 771 and 12. Williamsport Westfall- 396, 379= 775. A pair of sophomores led the way for the Galion Tigers over the weekend. Matthew McMullen turned in the top score for Galion, shooting a 78 on Friday and an 85 on Saturday for a 36-hole total of 163, good for a tie for 19th place overall. Spencer Keller shot an 84 and an 83 for a 25th place tying score of 167. The three seniors, Matt Kingseed, Jack McElligott and Kaleb Harsh all saw their impressive careers come to an end over the weekend. Kingseed shot his way to a 37th overall finish after shooting an 84 on Friday and a 90 on Saturday for a 36-hole total of 174. McElligott fired an 87 and an 88 to finish with a total score of 175 which put him in a tie for 38th overall in the field. Harsh shot a 36-hole score of 190 (94, 96) to finish tied for 60th overall for the blue and orange. 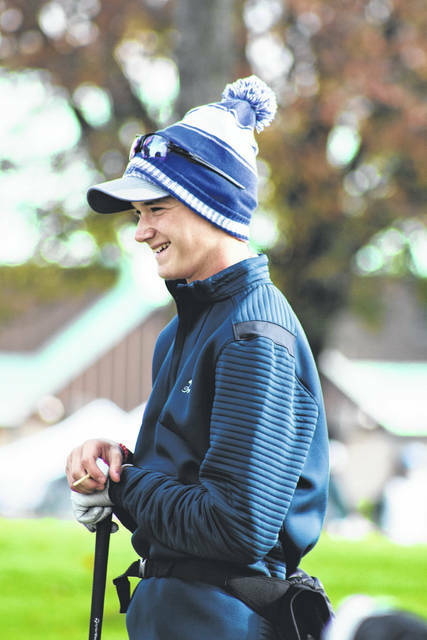 https://www.galioninquirer.com/wp-content/uploads/sites/38/2018/10/web1_IMG_0045.jpgErin Miller | Galion Inquirer Galion golfer Matthew McMullen finished with the best score on the team at the Division II Golf State Tournament over the weekend, shooting a 36-hole score of 163. The Tigers finished fifth as a team in their second consecutive appearance in the state tourney.